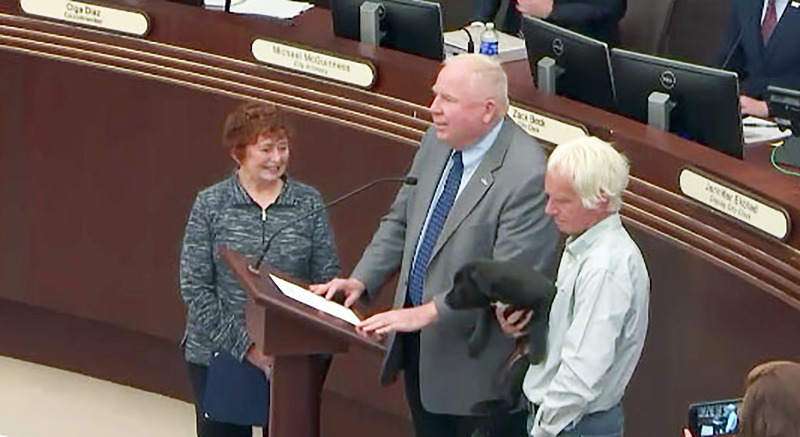 Two Escondido residents were honored at the March 20 city council meeting for their quick action in saving nine puppies that had been abandoned in a trash can in a sealed bag at Kit Carson Park. In the photo Mayor Paul McNamara (center) gives certificates to Bill Dixon and Merrillyn Carpenter recognizing them for their Good Samaritan act on Thursday, January 31, 2019. Dixon is shown holding one of the pups. “As a result of their keen observations and prompt response, those puppies are alive today. On behalf of the Escondido City Council, I thank you for taking action,” said the mayor. Some of the puppies have been adopted and others are available for adoption from the Escondido Humane Society. This remains an open case to find the person responsible for abandoning the puppies.